Transform your patio into a lush paradise with heat-loving tropicals in containers. From bold Elephant Ears to the vivid flowers of Hibiscus and Mandevilla, tropicals instantly transform your space but don’t require too much maintenance. Read on to learn more about some fabulous plants we recommend for tropical patios. Tropical Hibiscus (Hibiscus rosa-sinensis) are hardy in zones 9 – 11, but in regions like ours, they make great summer patio plants that can then be brought indoors for the winter. Flowers are bold and dramatic reds, oranges, whites, or pinks, each bloom lasting a single day. But since the plant produces flowers constantly, you will always have blooms throughout the summer. Grow in sun to part sun and water generously, as hibiscus are thirsty plants. Feed regularly to keep your hibiscus blooming. If you decide to bring your hibiscus inside for the winter, make sure you place it in a spot where it can get bright, direct sunlight for at least 2 to 3 hours a day. After temperatures consistently return to 50 °F or more, you can return you plant outside. Overwintered hibiscus benefit from pruning in spring. A woody vine native to South America, Bougainvillea provides excellent vertical interest when grown in a container onto a trellis. It may also be trained into tree form. In the landscape, it becomes quite large, so containerized plants will need regular pruning to keep them from outgrowing their pots. Flowers are profuse and brightly colored pinks, purples, or oranges. Like most other tropicals Bougainvillea needs full sun. It is relatively drought-tolerant. Overwatering will cause leaves to wilt and blooming to stop. Fertilize often for best flowering. Another great annual vine for tropical gardens is Mandevilla. A prolific bloomer, Madevilla’s trumpet-shaped flowers (usually red, pink, or white) will instantly brighten up your patio. They are also very attractive to hummingbirds. Mandevilla can be grown in a pot on a trellis or planted in the landscape to climb a fence for the summer. If you want to overwinter it inside, cut it back hard before you bring it inside and make sure it gets plenty of light. You may also find Mandevilla sold as Dipladenia. Dipladenia, however, is a mounding or trailing form of the plant and is best for cascading over hanging baskets or container edges. Fertilize regularly to keep Mandevilla in bloom and cut back as needed to keep the vine to size. Flower colors range from red-orange, pink, yellow, purple and bicolor. Grow in full sun. 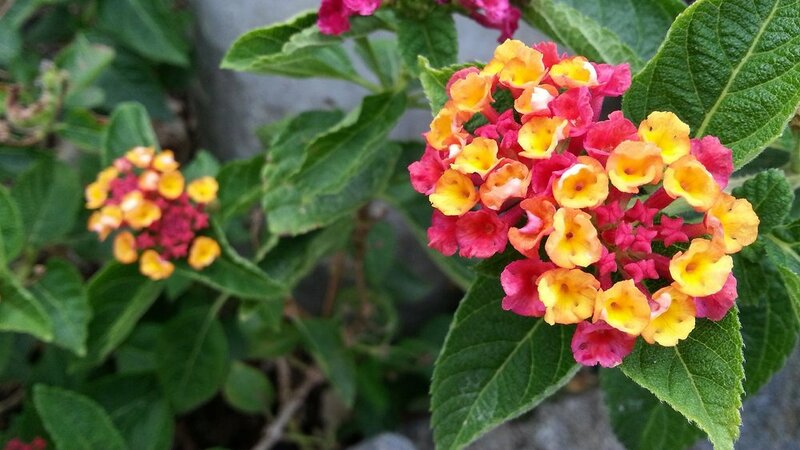 Lantana is quite drought tolerant but should not completely dry out between waterings. Fertilize with a balanced NPK ratio, such as 10-10-10, occasionally. Too much fertilizer will cause the plant to produce more leaves and new growth than flowers. Patio banana trees may not reliably produce fruit in North Carolina, but their large upright leaves alone make them dramatic and lush foliage plants, especially alongside the brilliant flowers of Hibiscus and Lantana. Both green and red-leaved varieties are widely available. Some may survive in the landscape if properly mulched for the winter. Grow in full sun and make sure your banana receives plenty of water. In summer, this is at least once a day. If the leaf tips begin to brown, however, this is a sign of overwatering. Bananas also like high humidity and do best if they are kept in areas that do not get too much wind. Fertilize with a high-nitrogen fertilizer for best growth. Over time, lower leaves may brown and should be pruned off. After nightly temperatures drop below 50°F, bananas will stop growing. Cut back leaves and mulch heavily if you plant to try overwintering it in the landscape. Elephant Ears are one of the most popular tropical plants due to their giant leaves that resemble the ear of an elephant. Some are winter hardy while others can be dug up and stored overwinter. Generally, Elephant Ears refer to Calocasia species, with downward facing leaves, and sometime Alocasia, whose leaves are upright. You’ll find a wide selection of colors and sizes at Atlantic, both as corms in spring and as a plant in early summer. Most Elephant Ears should be grown in full sun or part shade, although a few cultivars, such as ‘Black Magic,’ can take full shade. Whether grown in a container or in the landscape, make sure Elephant Ears get plenty of water. They are also heavy feeders and require monthly slow-release fertilizer, such as Bonemeal or Bloodmeal. Like Bananas, lower leaves that become brown with age can be pruned off. A low-maintenance, easy-to-grow tropical, Angel’s Trumpet is an old-fashioned favorite. This South American native can become 15 feet tall if grown in warmer climates. Enormous bell-shaped flowers dangle plentifully from the branches, with colors ranging from pure white to peach or yellow. In zone 7, it is best grown in a container that can be kept in a basement or garage over winter. During this time, the plant will lose leaves and become dormant, so keeping it in a bright location isn’t necessary. In spring, Angel Trumpet’s will grow from the base of the plant. Angel Trumpet’s prefer full sun and need sufficient water during hot weather. Fast growers, fertilize them regularly with a bloom boosting fertilizer like 15-30-15 at least every other week for the best growth and blooms. Removing spent flowers will keep the plant looking tidy. All parts of Angel Trumpet are poisonous so be careful with placement if you have dogs or children. The bold leaves and flowers of Canna Lily are showstoppers in the garden. Some cultivars, like ‘Tropicana,’ have colorfully striped leaves; others are pure green or almost black. Flower colors are bright and are available in shades of red, orange, and yellow. In zone 7 and above, Canna Lilies are hardy outdoor plants, but make dramatic container plants on a tropical themed patio, too. If you decide to grow in a pot, make sure you select a container that is at least 18” wide to accommodate this big plant. Grow in full sun and keep soil moist. Canna Lillies do not like to dry out. Fertilize regularly and deadhead spent blooms for a tidy appearance. Over time, your Cannas will multiple by rhizomes under the soil. These can be dug up and split for more plants.